Ah, New Balance. The brand that continually pushes its weight in the advertising category with incredible imagery and stories, yet has failed to create that top performing boot that fans crave. 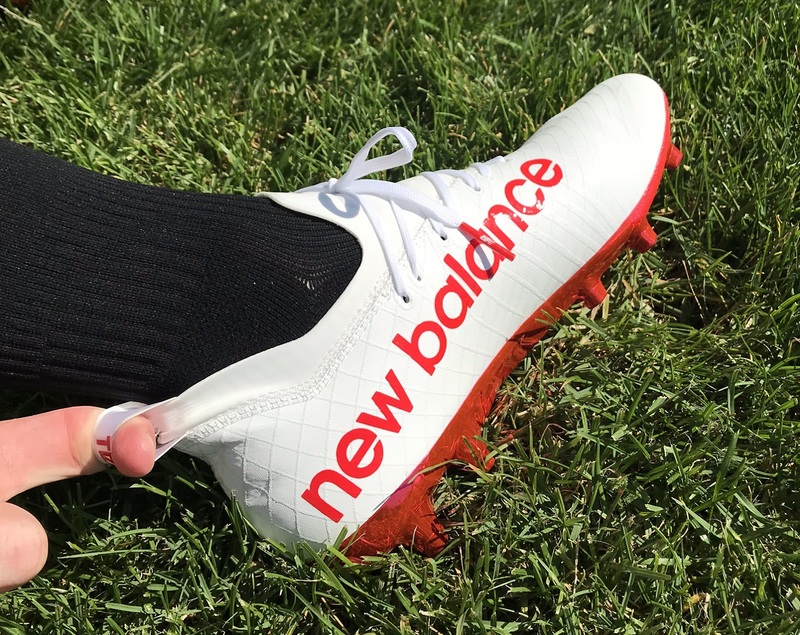 With each new release comes much anticipation and high expectations for the boot that will increase NB’s stake in the market. Boot after boot has failed, but finally the Tekela is here! 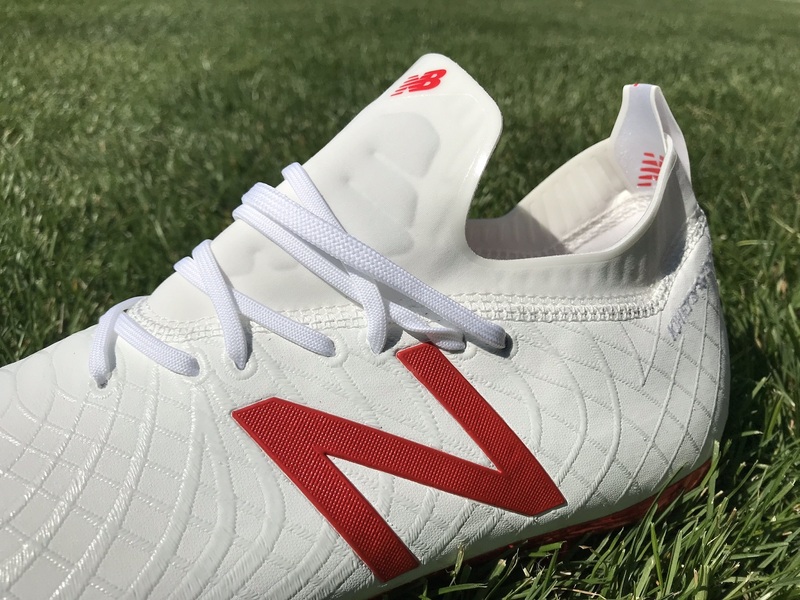 The New Balance Tekela is a boot “for the innovators who use speed and maneuverability to change the outcome of games.” It features a full foot micro fiber upper with dynamic kinetic stitch embroidered bands, a TPU outsole with inlayed nylon chassis and conical studs for 360 rotational traction and agility. They can talk the talk, but can they walk it? The answer is a resounding yes. 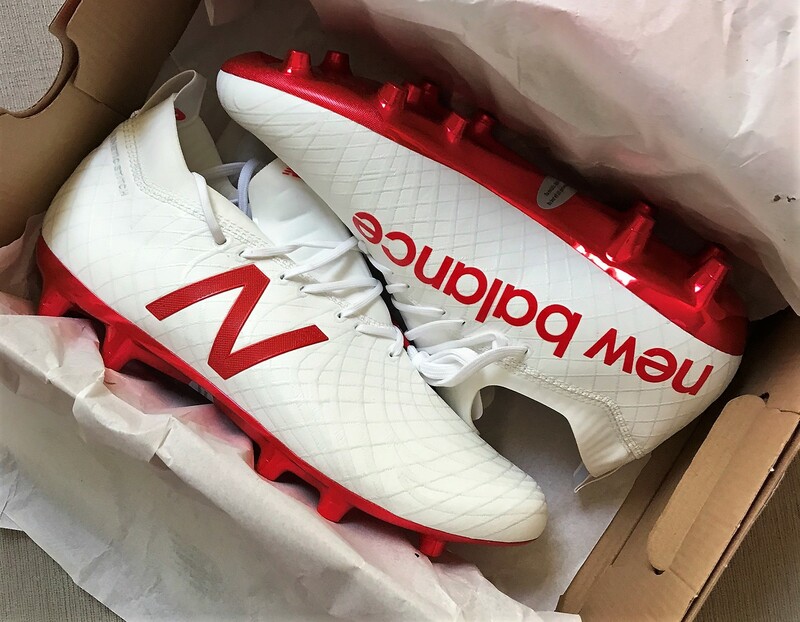 There is a lot to like about these and they really are the boots to take NB into a new era, down the path to on foot stardom. Think I’m kidding? Check the full review below. 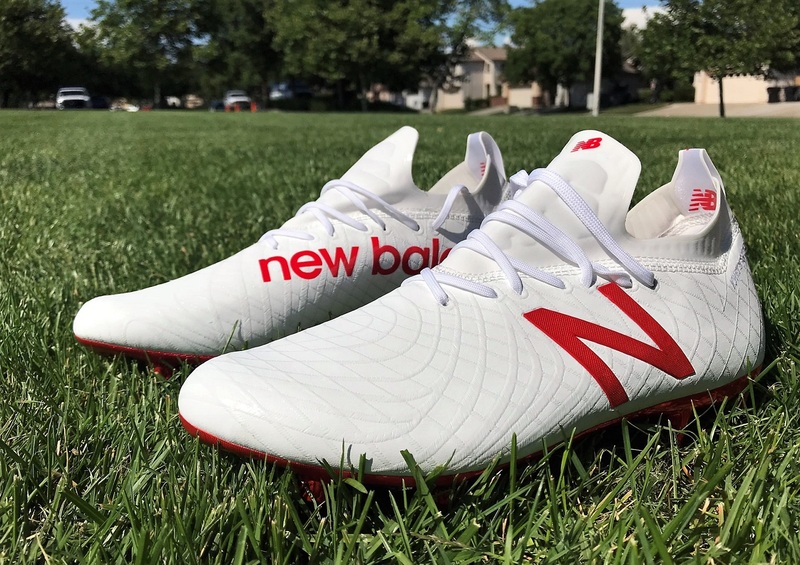 Find the NB Tekela available at soccer.com. As with all NB releases, I was excited when they were released, but trepid about how they would actually perform. Right out of the box, these are different to any other NB boot. 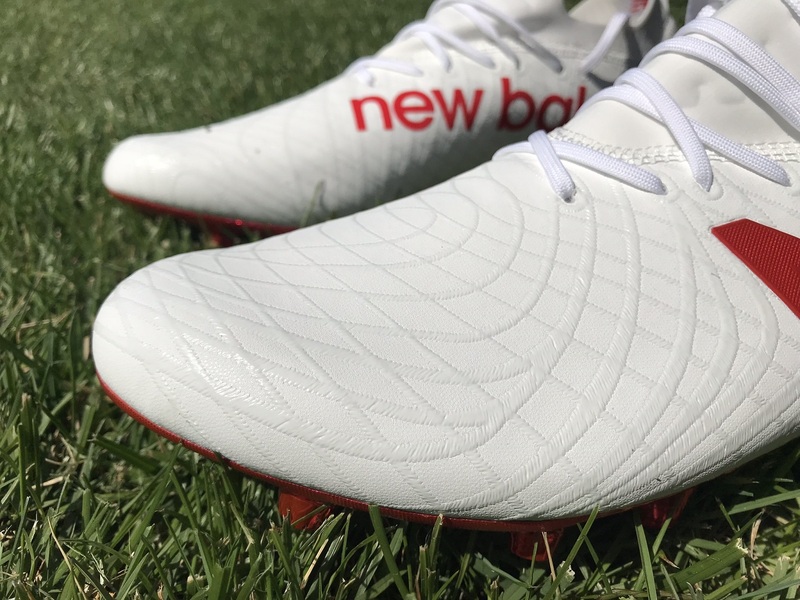 The shape is much more aligned with standard boot releases, and the upper material is a lot more pliable with natural movement under your fingers. Visually, they are also pretty stunning, the mix of White with Red detailing is very clean. First thing to note is that the ankle opening features an elasticated mid-cut mesh collar. It is very unique and actually took some time looking at to figure out what was actually going on with them. Basically, the entire collar is made of a mesh material, with the elastic placed along the inside, right around the collar, creating a gripped region to keep your foot in place. Honestly, there is not another collar on the market that has the same type of feel as these. To the touch, it actually feels like a rubber material, with added stretch and bounce back as it forms around your ankle. In order to get your foot into the boot, there is a pull tab on the heel. Rest assured you will use this pull tab every time you put the boots on! The elastic around the ankle lining is tough to get past with socks on, especially with the opening being so narrow, so you really have to wiggle your foot in. It seems odd to say, but if you have dodgy ankles, this might actually deter you from wearing them. For the rest of us, it is the first step to getting your foot into a quality performing boot! So, we talked a little bit about the collar above and getting your foot into the boot. Again, this is the first step in getting a very snug and comfortable boot on your foot, so don’t be deterred when getting them on. When you do get them on, they are a great fitting boot that naturally hugs your foot in all the right places. The shape and cut around the ankle lines up perfectly around your foot and it doesn’t cause any unnecessary pressure. It’s fit is snug, but not overly restrictive, with the material gently cupping the undulations around the ankle. What makes it work is the elastic layer, as it grips the material in your sock and provides a locked down feel. A concern that a few people have requested more information on is the higher cut on the Achilles. With any boot that features more material around the back of the boot there is the threat of blisters because of rubbing. But rest assured that is not the case here. Again the material is pliable, so it moves very naturally with your motions. The upper material also has a lot of natural motion to it, with a very pliable feel right out of the box. I took some time breaking these in just because I wasn’t sure what I was getting into. Over the course of a few training sessions and into games, they never caused any comfort issues. in fact, they had the feel of an already broken in boot right from first wear. New Balance has gone with a pliable microfiber upper on the Tekela. To be honest, it is supple enough that it could fool fans into thinking it a leather! Right across that upper, you might have noticed what looks like a pretty unusual pattern, that zig-zags from the toe though to the heel. This is actually called Kenetic Stitch that are designed to provide extraordinary stability and maneuverability to players in play. They are essentially embroidered bands, sewn through the upper. In terms of what they actually offer, I can’t provide a scientific breakdown. But from my experience, I found that they are a key contributor to the pliable nature of the upper and they play a role in offering more dimension on the ball. Or, they enhance the feel thanks to the added texturing. I’m a fan of the design, but visually and from a performance perspective. It adds a unique element to the Tekela silo in a positive fashion. There is no direct connection between the Tekela and a specific type/style of player on the pitch. NB has kept things vague with their “for the innovators who use speed and maneuverability to change the outcome of games.” tagline. There is no reference to control, accuracy or shooting. So, you wouldn’t be remiss for thinking they were more of a playmakers boot. That is exactly where I see them being more effectively marketed. But, in play they have so much more to offer. I see them as being the perfect “architect” boot, for the player that wants to implement the perfect design on pitch. 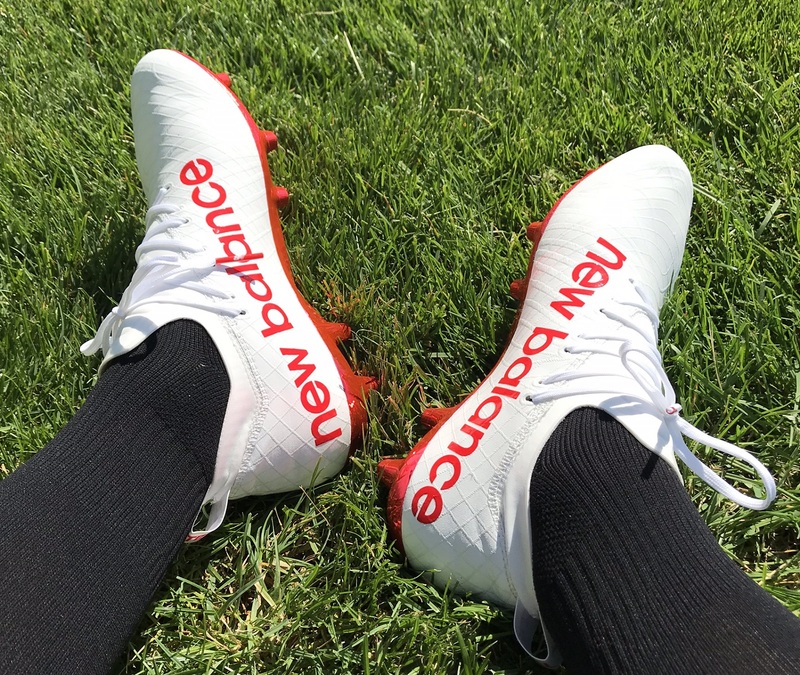 Simply having a synthetic upper would make them more of a speed focused boot. 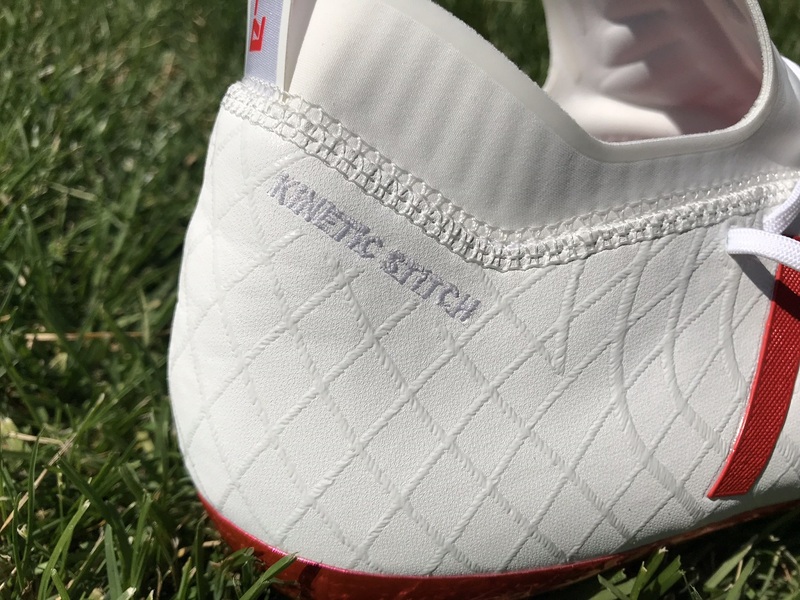 By adding Kenetic Stitch, overall performance is increased substantially, especially when it comes to control and first touch. Think of the stitch as a very light sandpaper, it enhances the grip you get as the ball comes in contact without being over sticky. 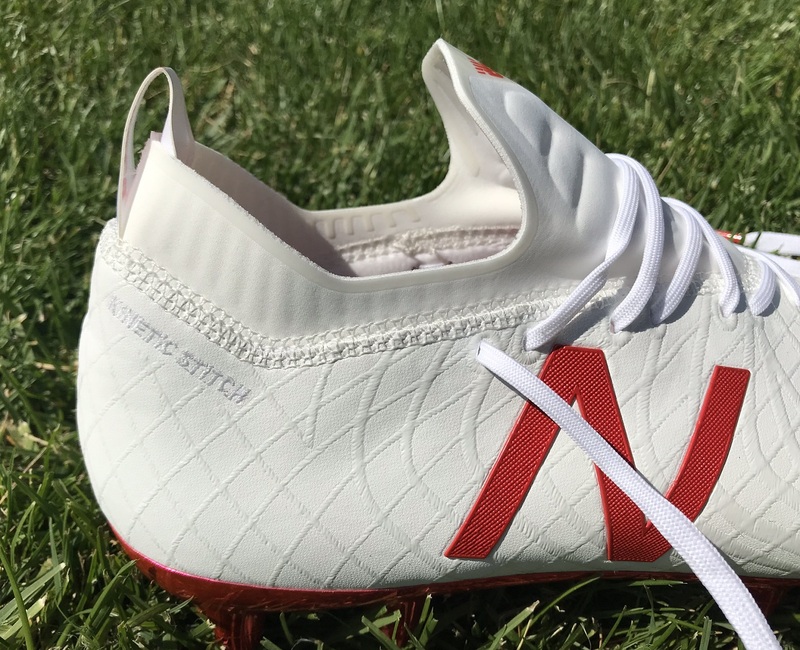 And since it runs right across the surface of the boot, you get a very uniform feel no matter how you are coming onto the ball. Are they a shooting boot? Isn’t every boot a shooting boot? Pretty much. But, sometimes brands will place a direct emphasis through the strike zone that enhances how the ball comes in contact while striking full force. Here, New Balance could easily have removed the Kenetic Stitch through the strikezone, but they didn’t. That tells me they wanted to provide strikers with a little extra texturing through the area. While striking shots, I found them to be sufficient, soaking up most of the impact, allowing me to strike more confidently. So, although they are not marketing for shooting, they hold up well in that area. Underfoot, things have been toned down a bit compared to other NB releases. A firm ground conical stud combination looks right at home on the red chrome plate. On pitch, you get perfect rotational traction without unnecessary drag. During testing, I wore them on FG and TF pitches with positive results. An unusual addition is a small lip just below the toe region of the plate. 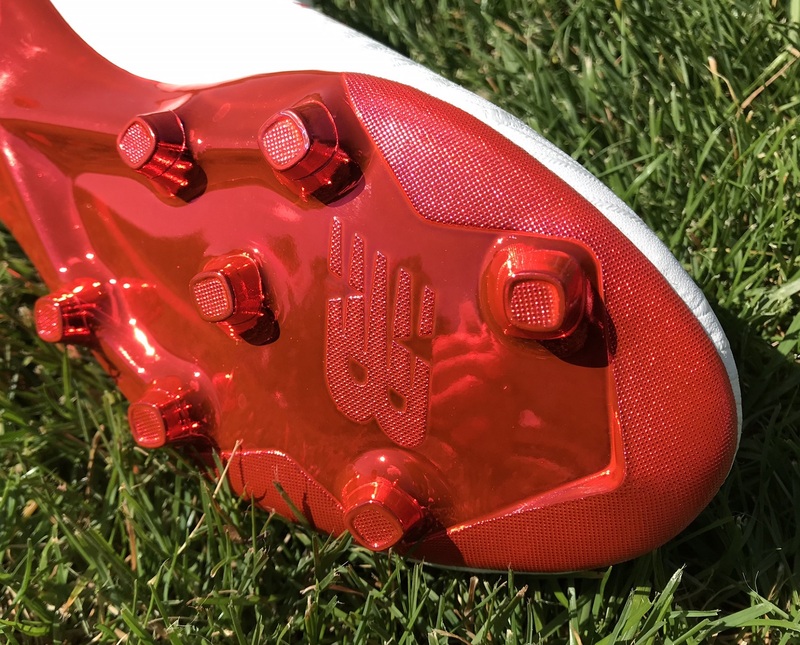 It is there to enhance traction as you push-off the surface, where the tip of the soleplate pushes away from the ground. A simple, yet effective addition.. The actual plate itself is also very pliable. You can bend it in pretty much any direction ensuring it is working with your foot as you are in stride. You don’t get any sort of rigid feel, which actually helps reduce the break in time needed. The biggest challenge with these is getting your feet in and out through he tight ankle opening. It definitely poses a continuous challenge. The first thing you will want to do is completely loosen up the laces, ensuring you have all the stretch you can get from the boot while slipping them on. But once you do get them on, they are very accommodating. I’d easily rate them as a medium/wide fitting boot with natural length. One of the bonuses is the stretchy feel provided by the upper, allowing for some additional room if your feet press up against the material. 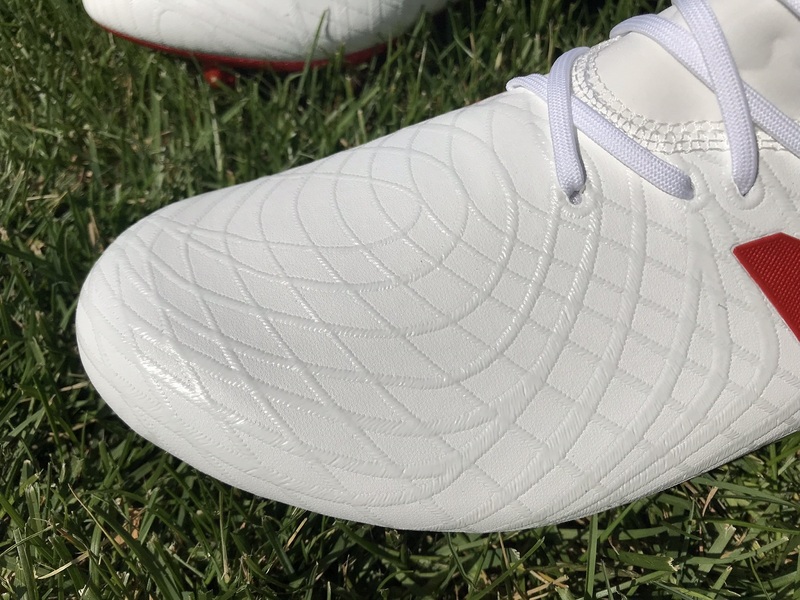 In terms of comparison, I’d very much rate the fit inside the boot (not the opening) as similar to the original Nike Hypervenom Phantom silo. Both boots are similar in length and rounded shape around the forefoot. Best NB Release To Date? It is official. I’m sold on these! It has taken a few years, several silos and numerous releases to get to a boot that has the ability to be a real market influencer. This is the boot. In a nutshell, the Tekela fits comfortably, looks sharp and performs effectively well on pitch. If NB continue with releases like this, boots that fans want to wear, they have the potential to really stake a solid claim in the US market! 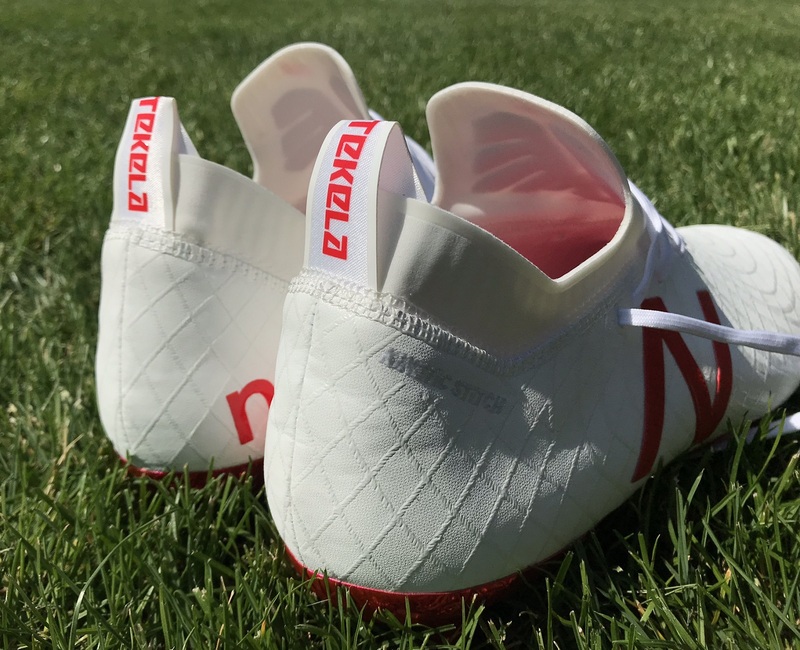 To date, the only colorway released has been the Otruska Pack version, which are the ones that will be worn by players at the World Cup. It retails for $249.99. The white upper with stitch gets dirty pretty quickly, and it is not that easy to clean the stitching. Also, the chrome soleplate will chip off over time, so after a few wears they lose their shiny appearance. But performance wise, there is nothing negative to note! Is there room for further improvement? YES, and I look forward to seeing it. Highlight: The best NB release to date, featuring a very pliable and natural feeling upper thanks to the inclusion of Kenetic Stitch. Category: Agility – I see them as a mix of control and creator. Weight: 8.5oz, although not the lightest boot on the market, they are well-balanced. Would I Buy Them: It is the first New Balance release that I am giving a definite YES to! Player Position: These are very versatile, with a lot to offer multiple players. 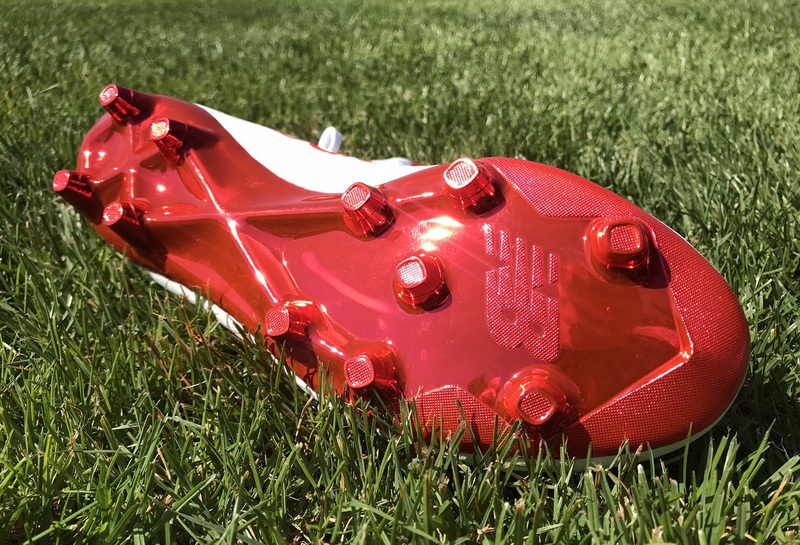 But, I see them as a creator style boot, designed for players that like to play in the middle of the pitch and make things happen.